Vladimir Lukhtanov, entomologist and evolutionary biologist at the Zoological Institute in St. Petersburg, Russia, made a startling discovery: what people had thought was a population of a common species, turned out to be a whole new organism and, moreover – one with an interesting evolutionary history. 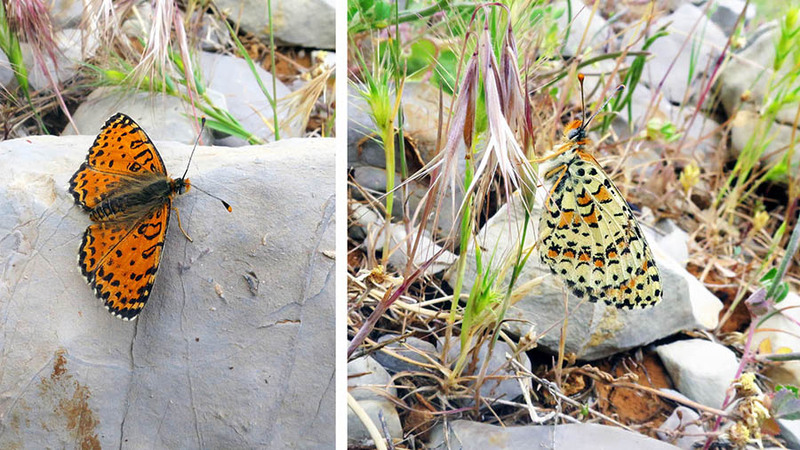 This new species is named Acentria’s fritillary (Melitaea acentria) and was found flying right over the slopes of the popular Mount Hermon ski resort in northern Israel. It is described in the open access journal Comparative Cytogenetics. “To me, it was a surprise that no one had already discovered it,” says Vladimir Lukhtanov. “Thousands of people had observed and many had even photographed this beautifully coloured butterfly, yet no one recognised it as a separate species. The lepidopterists (experts in butterflies and moths) had been sure that the Hermon samples belonged to the common species called Persian fritillary (Melitaea persea), because of their similar appearance, but nobody made the effort to study their internal anatomy and DNA”. In 2012, Vladimir Lukhtanov, together with his students, initiated an exhaustive study of Israeli butterflies using an array of modern and traditional research techniques. In 2013, Asya Novikova (until 2012, a master’s student at St. Petersburg University and, from 2013, a PhD student at the Hebrew University, Jerusalem) sampled a few fritillaries from Mt. Hermon. It was at that time when the researchers noticed that the specimens “didn’t look right” – their genitalia appeared different from those of the typical Persian fritillary. Over the next few years, Lukhtanov and his students studied this population in-depth. They carried out sequencing DNA from the specimens and found that they had a unique molecular signature – very different from the DNA of any other fritillary. The Acentria’s fritillary seems to be endemic in northern Israel and the neighbouring territories of Syria and Lebanon. Its evolutionary history is likely to prove interesting.